Yesterday we celebrated Esther's birthday with the other girls here at GSF who are close to her age. When we first came, it took a while for Esther to make new friends. The girls here have mostly grown up together, and it is sometimes intimidating to reach out. Over the past couple of months, Esther has really tried to start getting to know these girls better. She joined the choir with a few of them and has begun spending some time with these girls in the afternoons. For Esther's birthday party, she wanted to invite all the GSF girls age 5-10 over, which is a dozen girls. As we prepared for the girls to come over, it occurred to me, that Esther's friendship with these girls provides our family the opportunity to help show God's love to these girls and disciple them. We all had a wonderful afternoon together! As the girls arrived we began making bracelets and rings. 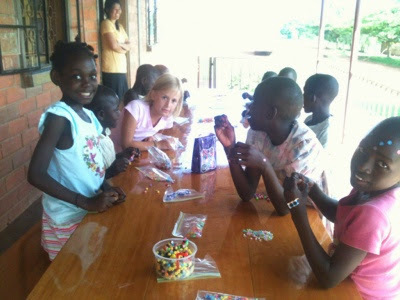 As they finished making their jewelry, we sang Happy Birthday to Esther and we all had cupcakes. They starting jumping rope and then watered Esther. "Watering" is a birthday tradition here at GSF. 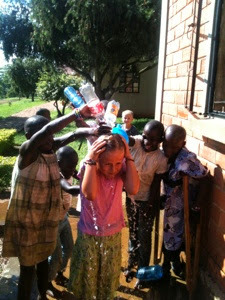 Esther was a great sport. After Esther got changed, we brought all the girls in our house for a movie and popcorn. They all enjoyed it. Before the movie I took a brief moment to tell the girls of God's love for them and our love for them, and to pray for Esther and all of them. I was thankful for that brief moment and hope to have many more. Once the movie was over we all went outside for some more playtime. 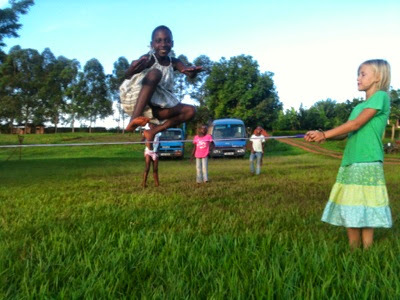 The girls played hide-and seek, jump rope, long jump, high jump, and a few other games where they run around outside. Here is a photo of Rosie doing the high jump. We are so thankful that God has blessed us with our daughter Esther. We are also thankful for these many other girls who are a part of our larger GSF family. Please pray for all these girls, that they would know and live out the love of God in Jesus, and that we would encourage them as they grow in Him.